One of my little nephews turned four today, just five weeks after my little man turned four. 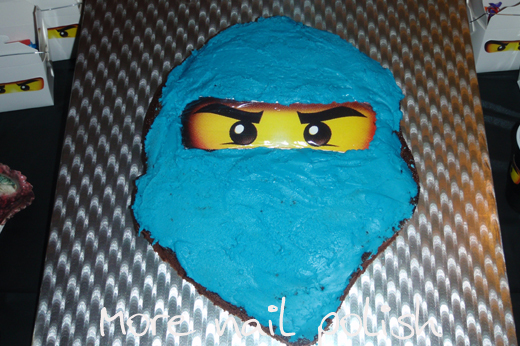 His mum and dad had organised an excellent ninja themed party for him today because he is totally into Lego's Ninjago. 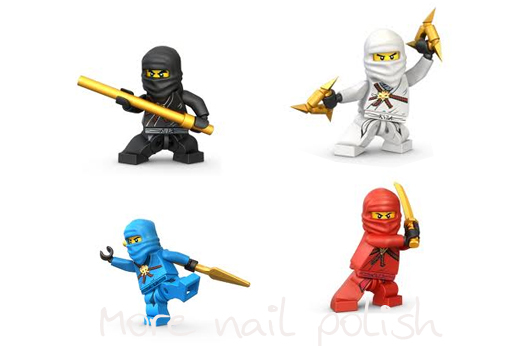 If you don't know about Ninjago, they are a whole story line of Lego, and include the below four original mini figures. I decided to create each of these characters on my fingers. Cole the black one on my index finger, Jay the blue one on my index finger, Kai the red one on my ring finger and Zane the white one on my pinky. If you look closely you can see that each actually has a different facial expression (or should I say eye expression). There is also a new green ninja now, so I added him to my thumb. In my hand I'm holding a Kai LED torch keyring, which was part of the birthday gift before I wrapped it up. I created all of these using temporary tattoo paper, which I originally showed as butterflies here, and also created a tutorial. The base polish is two coats of Layla Mercury Twilight, which has become my go to silver holo polish - I'm nearly half way through that bottle, I will need to get another soon! Finally, here is the awesome cake that my brother baked, and check out those very cute take home lolly boxes in the background that they also created! My sister in law had also organised little prizes for everyone throughout the party, some won them through games, others just for fun reasons. I received mine for having the best nails. What I forgot to take photos of was all of us dressed up as ninjas, mostly with t-shirt masks wrapped around our heads and dressed in monochromatic colours. It was great fun! Awesome well done u guys!!! That is such a cute mani, I bet your nephew loved it. this is just tooooo cute for words! Too cute! Love the cake. My son loves Ninjago!! This is so cute and creative. Ahh! That is so awesome! Ha, these rock! You did good! THIS IS GREAT!! YOU ROCK!! 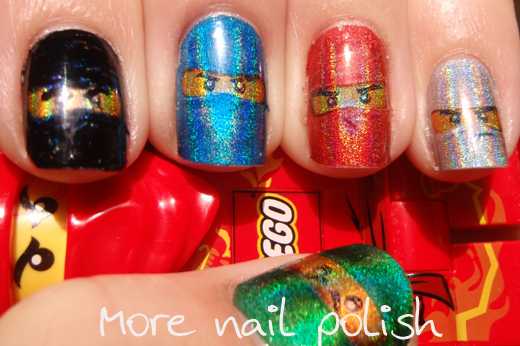 Totally creative nails - in fact a very creative family by the looks of things. Well done. haha! This is so cute! What a cool mani! I can not explain how freaking awesome I think these are!!! 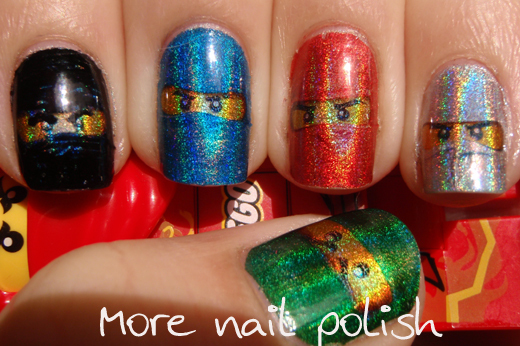 I mean look at them, you have tiny, little, holographic ninjas on your nails!!! You really are, hands down, the coolest aunt ever! Yay! This is so cool. 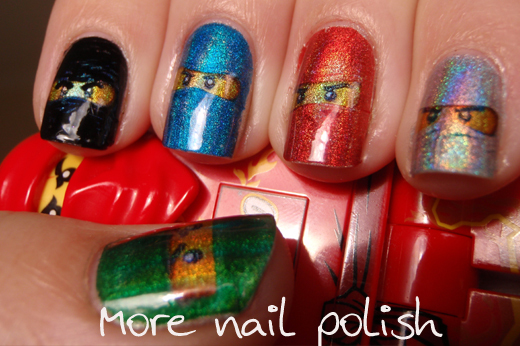 I love that the ninjas have expressions and that you used holographic colors! Old and not around any little boys now that I retired from teaching PK and K Sunday school class so don't know about these Legos. But my guess is your nephew will be so busy at his party he won't even notice how cool his aunt is with her great nails...but wonderful for you to go to this ends to continue his fav theme of play. I did read your tutorial you so kindly provided after were were all wowed by your butterflies! Now I need your amazing Layla ceramic effects polishes! Thank you for the Ozotic Colour Guide - I really appreciate it! This is why you are my FAVORITE blog!! 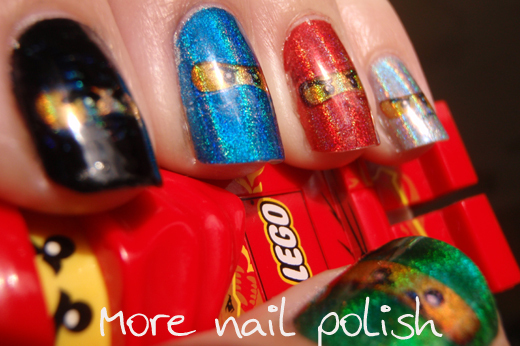 Fab nails, great innovative ideas, and offshoots to other things that I LOVE! First Game of Thrones now Ninjago?! LOVE LOVE LOVE!!!! I REALLY need to figure out water decals! Where can I get these tattoos I would really like to do this!!! I made them myself by printing the ninjago figures on temporary tatto paper I purchased on ebay. Thank you sooooo much i never thought of that what a great idea! Can you please tell me where I can get these tattoos! I REALLY want to do this and can't find tattoos!!! I would totally buy these if you made them to sell!! OMG my son loves loves Ninjago. He would flip over these. Add me to the list of uncrafty people who would buy these if you wanted to sell them. I love this! But where did you find the templates for the ninja faces?? I haven't found any good images that match the ones you have.